It’s been over two years since my daughter left home to go to college and prior to that it had been at least three more since we’d actually sat down and had a proper dinner together. Eating with her is only one of the things I miss since the nest has been emptied. Sleeping all night, cuddled feet to feet after a rainy day marathon of bad girl flicks is another. Not to mention the breakfasts on Saturday mornings we used to share painting each other’s nails and discussing things like the drama of her school years and all the participants involved. Or just the sweet chattering background noise of her in my home that is no longer heard: tapping on the computer, the weird ring tones in her phone, her laughter with friends and the sound of her clumsy feet, that she inherited from her mom, as she would clomp down the hallways upon waking followed by the sounds of fridge and cabinets opening and closing. I can also draw a line of her life as she aged and dot it with odd and peculiar food trends. When she was little she wouldn’t touch a single variety of cheese but loved sushi. But when she was older she became obsessed with pungent asiago. One year, she was addicted to my lemon chicken dish and would request it almost any chance she could get. While going through an attitudinal teenage spell she preferred tempeh takeout from the health food restaurant in town instead of mom’s cooking when her friends would sleep over. In her tweens she had an obsession with anime and anything Asian therefore the translation into food became a lust for Philippine sticky rice for which she made me get a bamboo basket to make it properly and a bento box to carry it in for school lunches. When she was thirteen, all she wanted was tofu with soy sauce and weird Mexican candies that tasted like salt and fire such as saladitos and suckers with bugs in them. Then there were the random and odd fads that came and stayed for maybe a millisecond but were saturated in their fanaticism like Nutella crepes (after our trip to Italy), croissants, popcorn with milk duds melted into the batch, big, fat dill pickles, vegetable hot mix, and piping hot Cheetos. The two last things I can remember being constantly requested before she moved away were my famous gorgonzola chicken salad with the Champagne dressing and baked filets of brown sugar salmon. Last week she came to visit, nostalgic for a sleepover and some hang time with mom – something that of course made me eager to make her a special meal just like old times. I rummaged around in my old file box and brought out the comforting classic of chicken piccata with fettuccine (being that it was national fettuccine day and all). It’s not sophisticated or laden with superfoods or typical of the kind of meal I am prone to make today but it brought me back into the role of being a mom wanting nothing more than to feed my baby something belly warming, heart filling and simply good. Who doesn’t occasionally crave the taste of home? Cut the chicken breast halves horizontally, butterflying them open and pound each piece to a ¼-inch thickness. Mix together the flour, salt, pepper, and grated parmesan. Rinse the chicken pieces in water. Dredge them thoroughly in the flour mixture, until well coated. Heat olive oil and 2 tablespoons of the butter in a large skillet on medium high heat. Brown chicken pieces well on each side for about three minutes. Remove the chicken from the pan and reserve to a plate. Add the white wine, lemon juice, and capers to the pan. Use a spatula to scrape up the browned bits. Reduce the sauce by half. Whisk in the remaining 2 tablespoons of butter. Plate the chicken and serve with the sauce poured over the chicken. Sprinkle with parsley. 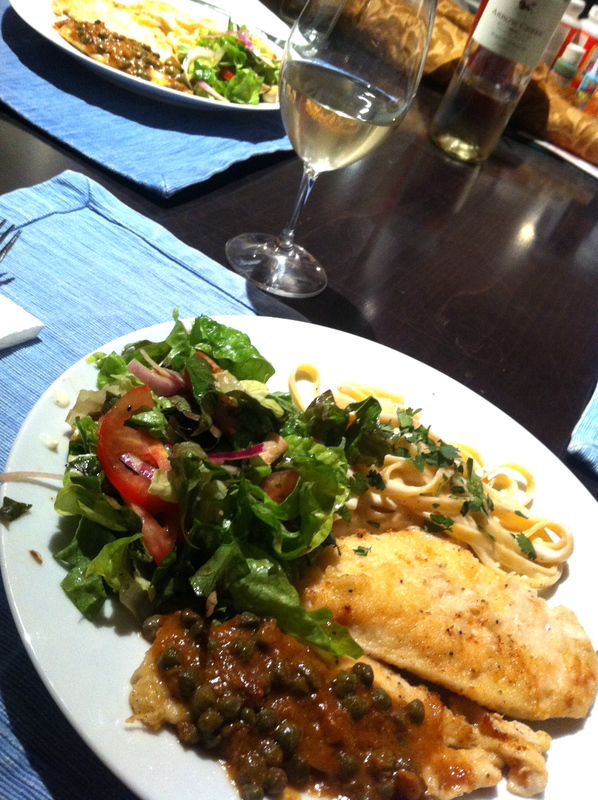 This entry was posted in Through The Stomach and tagged chicken piccata, homecooked meals, Kimberly Nichols, Unorthodox Foodie by unorthodoxfoodie. Bookmark the permalink.